The ROGERS Ultima Series CR55PL is a severe-duty 55-ton capacity lowbed semi-trailer designed with a full capacity load concentration in one half the deck length. The result is a trailer that can handle the most demanding operating conditions - day in and day out. 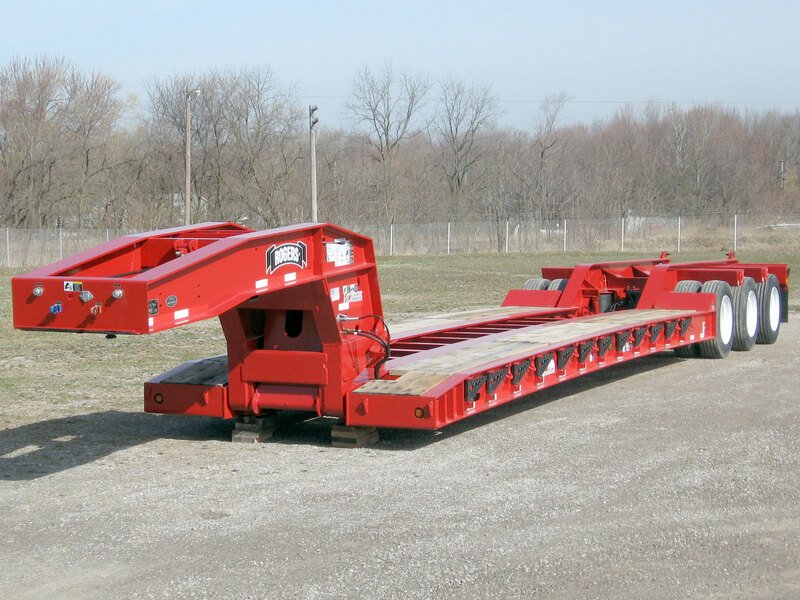 It features the ROGERS famous "No Foot"® Tower style gooseneck, exclusive "Croucher"® front end for easy loading and unloading of equipment, and a four-beam cambered deck design. This CR55 often serves as a starting point for custom designed hauling solutions for our customers. It has a "bucket pocket" of notched cross members in the deck and a "boom trough" of lowered cross members in the rear frame to increase overhead clearance when hauling excavators. The powerful "No Foot"® Tower style gooseneck uses low hydraulic pressures to detach and can lift a full trailer without shifting the load. Standard deck is 1 3/4" air-dried oak and has no center boards. Arch-type rear frame has sloped bridge ramps in front of the tires and trunnions between them. Standard feature: Preparation Package for adding a removable 4th axle. The package includes hinges and extended air and light lines. Standard rear frame: air ride suspension with mechanical height adjustment and 275/70R22.5 low-profile radial tires on steel disc wheels.